Accommodations - Indian Palms Vacation Club "
Welcome home! Your desert escape comes with all the comforts of a spacious, two-bedroom condo, including enough space for the whole family to eat, play, and relax. 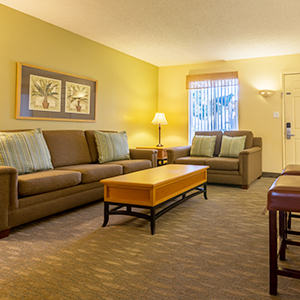 Each suite has its own unique layout and personality. But all include a plush queen-size bed in the master bedroom, plus two twin beds in the guest room and a queen-size sofa sleeper. Start the day with breakfast on your private patio and end it with a movie night. All suites are non-smoking.